Creating a new layer can be as simple as dragging an image from one file into another file. Before you begin, make sure that both the 05Start.psd and Door.psd files are open. First, you will rename Layer 1 with a more descriptive name. 1 In the Layers palette, double-click the name Layer 1, and type Door. 2 If necessary, drag the Door.psd and 05Start.psd image windows so that you can see at least part of both images. Then select the Door.psd image so that it is the active file. 3 In the toolbox, select the move tool (- ,.) and move it anywhere within the Door.psd image window. 4 Drag from the Door.psd file to the 05Start.psd file. As you drag into the 05Start.psd file, the pointer changes, appearing as a hollow arrow with a plus sign inside a small square. 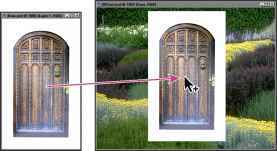 When you release the mouse button, the image of the door appears in the garden image of the 05Start.psd file. 5 Close the Door.psd file, and do not save your changes. In the Layers palette, notice that the door now appears on its own layer, and has the same name it had in the original file, Door. Note: If you want to expand the Layers palette, click the minimize/maximize box (Windows) or the resize box (Mac OS) at the top of the palette or drag down from the lower right corner. 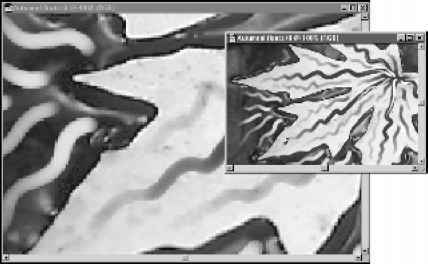 Dragging from the image window of one file into another file moves only the active layer. You can also drag a layer from the Layers palette of one file into the image window of another file.